Yesterday I was talking to a friend of mine about IQ level and she told me that hers has dropped to average ever since she become a home maker…hmmmm it get me thinking… I am confident that mine has drop to below average. Why? Because most of the time now I need my kids to remind me how spell certain words… I think it is a sign hehehe. Well… I am taking the initiative to move my IQ level up to average at least hehehe because my friend told me that reading and writing can improve your IQ… we’ll see. I know that it has been awhile since my last posting and yesterday when I opened my blog I was actually surprised that my last posting was in April… it has been close to half a year since I last wrote… no wonder my IQ has dropped hehehe. 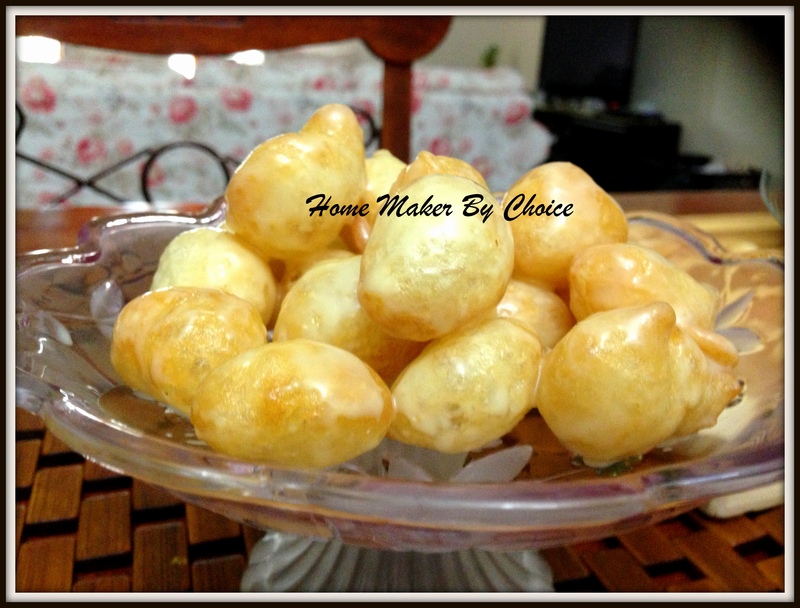 Orait orait orait… lets see my new recipe for today… Luqaimat. Luqaimat – لقيمات- is a well-known dessert between Arabs and it is a must dessert in arab home for iftar. It varies between country to country and I am ashame to let you know that I have never tasted this desert until last Ramadhan. Have seen it when I was in Kuwait but never had the guts to try because people said that it is soooo sweet. 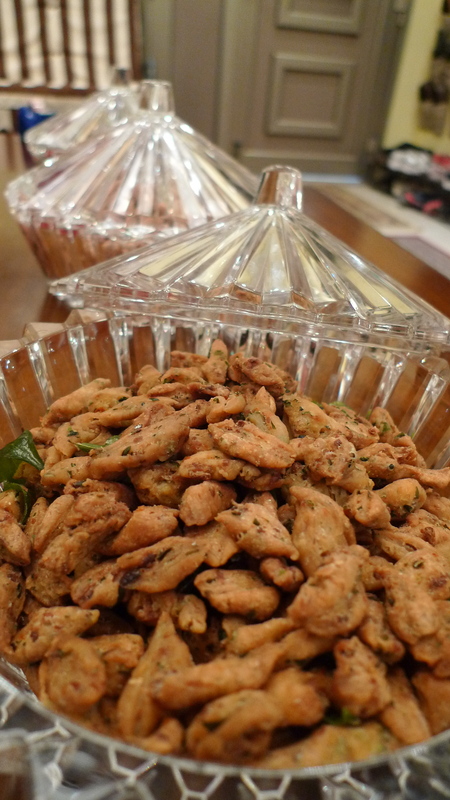 Luqaimat is also known as Crunchy Sweet Dumpling. The dumpling itself is not sweet but the syrup that is poured on top of it is the one that make is sweet. During the first week of last Ramadhan, we were invited by my other half’s customer to his house for iftar. This was my first time being invited by the local to their house. Kuwaities never invite a non family members to their house unless they really like you. So, we were quite nervous as my other half already told me that this customer is one of the richest family in Oman… so please make sure the kids behave. Their house is so huge and I would say it should be called a castle. They have a huge indoor pool and also a private beach… masyaallah, the house is so beautiful. Anyway… the dinner was great…buffet style even though only 11 of us and when it came to dessert time I was made to taste all the of them… nak tak nak kena lah try this luqaimat. It is rude to say no to their favourite dessert,right? I am surprised that it tasted not bad at all but since the syrup that was used has a hint of cardamon, I cant say I love it hehehe. So that was my first encounter with luqaimat. The second time I ate luqaimat was at another omani house that we went for iftar and I have to say that this family changed my opinion about this dessert. Their luqaimat was not covered with syrup and cardamon but it was covered with condense milk… it was great and delicious. 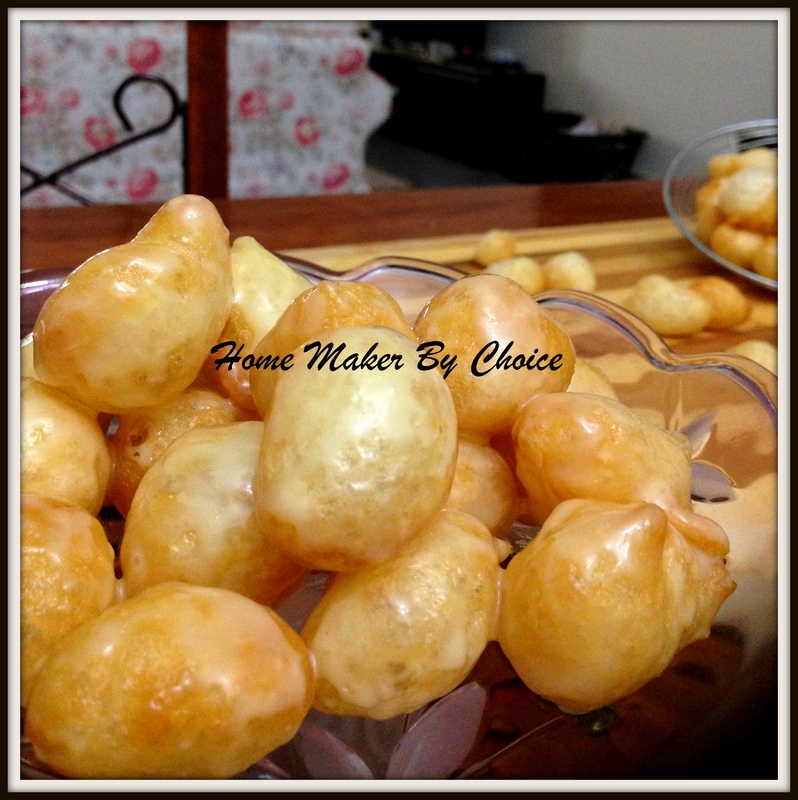 I managed to ask for a recipe and I am proud to tell you that I had made this dessert couple of times during the last Ramadhan. Below is the recipe and I dare you to try and make it. Happy baking! Mix all purpose flour, corn flour, yeast and sugar in a bowl. Gradually add the water and keep on mixing until you get a smooth batter. It should be in dropping consistency not too watery or too thick. Cover the batter for 1 or 2 hours until the batter doubled. The batter now should have bubbles and somewhat bouncy. Heat oil in a wok. 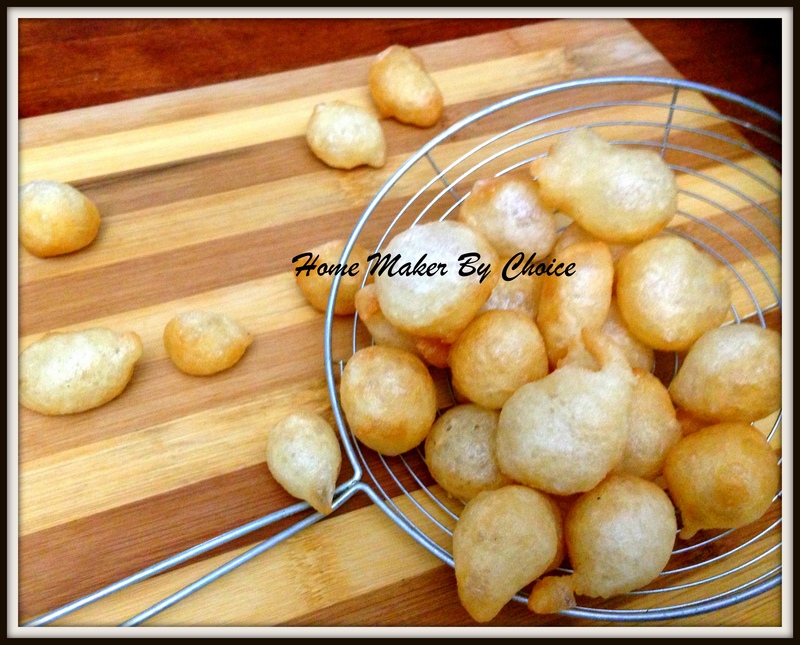 Scoop a small amount of batter with your fingers and drop them into the hot oil (macam nak buat cekodok). Fry till they turn golden brown. Remove from oil, and place them on kitchen paper. Pour condense milk or your favorite syrup on top. Clean the glutinous rice and soak with the coconut milk for 30 minutes. Drain the glutinous rice and place the coconut milk used for soaking the glutinous rice into a saucepan. 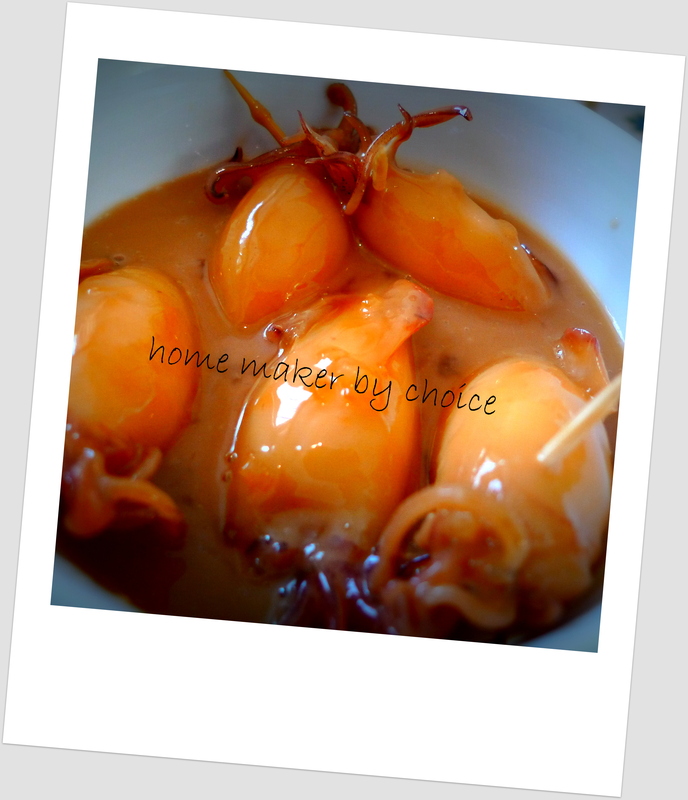 Fill the glutinous rice into the cleaned squid 1/2 full. Close it with the squid head and stick with toothpicks so that the rice won’t come out. Place it into the saucepan that has been filled with coconut milk. Once the glutinous rice is cooked, add the palm sugar and continue cooking until the coconut milk thicken. Enjoy! 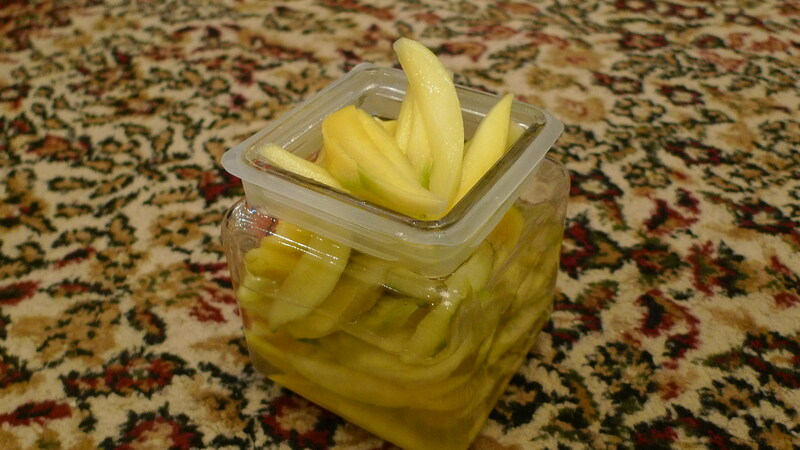 Jeruk Mangga….mouth watering….My mum always makes this jeruk whenever the mango tree behind our house berbuah. Since only my brother stays with her, practically nobody makan mangga ni…at times there will be few pail of mangga yang jatuh from the tree…sayang betul…so my mum selalulah buat jeruk mangga ni. Sometimes she will make ice cream jeruk mangga…it is soooooo delicious….Whenever we all balik KB, the first thing that my kids will do is open up my mum’s freezer….there will be all kind of ice cream; ice cream jeruk mangga, ice cream puree mangga, ice cream asam masin, ice cream milo and sometimes ice cream syrup bandung….bestnya! 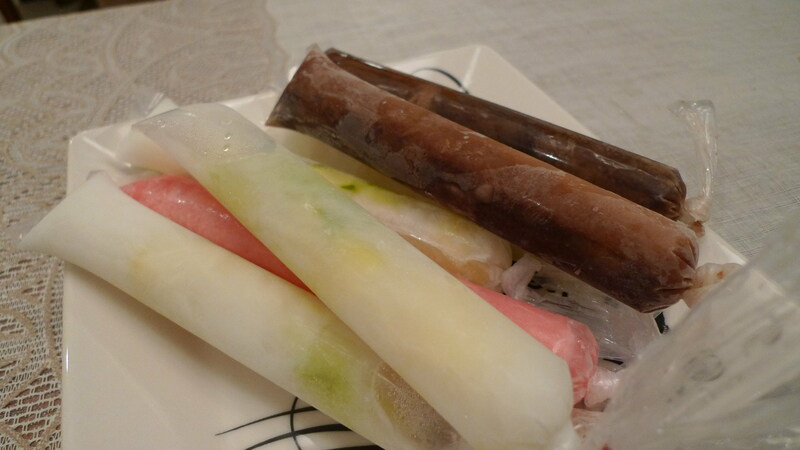 During my mum’s last visit to Kuwait which was Nov last year, she bought some of her ice cream mangga to her cucu…well…I did sorok few from my kids… you know… they sometimes makan ice cream ni macam makan nasi….nanti tak merasa pulak I… he he he. Since we are staying in Kuwait now, there is no chance of us to eat my mum’s jeruk mangga… unless we go back to Malaysia…so…I have to try and make it myself…alhamdulillah, it turn out ok. Nasib baik Lulu Hypermarket ada jual mangga muda, so dapatlah makan jeruk…. 2. Rendamkan dalam air garam sehingga tenggelam selama 1 malam. 4. Rendam dalam air kapur hingga tenggelam selama 3 – 4 jam. Toskan hingga kering. 5. Masukkan buah yg telah ditoskan dalam balang diselang seli dengan gula. 6. Biarkan 1 – 2 malam dan boleh dimakan. 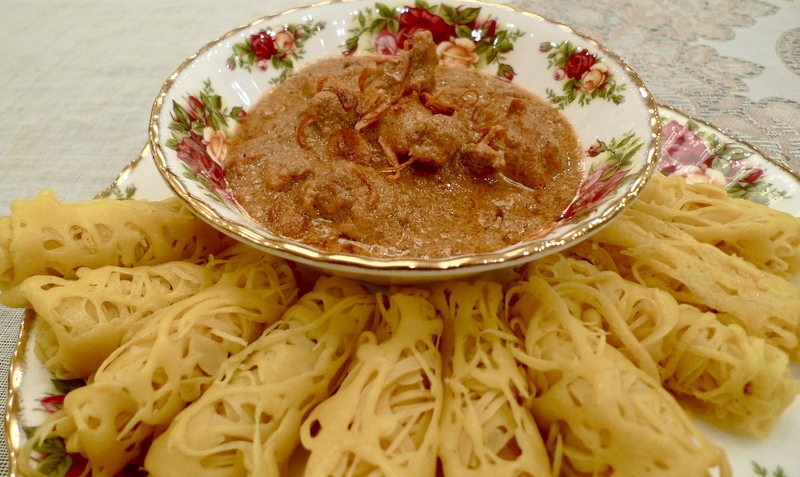 Kuzi and roti jala is one of my favourite food masa kecik2 dulu, selalunya my mum will tempah kuzi kambing and roti jala from Nik Simah (arwah) untuk raya or majlis cukur jambul. As for this resipi, I took it from my auntie (Nik Faridah) before I went to study in UK dulu but cant remember whether I did try this recipe or not while I was there. For those yang tak pernah rasa this dish, bila masak tu kena letak gula lebih sikit sebab kuzi ni kena rasa manis… baru sedap. Bahan A : Saffron, bawang putih dan halia ditumbuk halus dan lumurkan pada ayam, hati dan pedal. Perap seketika. Kemudian goreng ayam separuh masak, angkat dan ketepikan. Goreng hati dan pedal ayam sampai masak, bila sejuk dipotong dadu dan ketepikan. Bahan B : Goreng mengikut turutan, mula-mula goreng bawang merah utk dibuat bawang goreng, kemudian diikuti dengan badam dan kismis. Tumbuk bawang goreng dan ketepikan. Bahan C : Tumis kayu manis, bunga lawang, bunga cengkih dan pelaga, kemudian masukkan bahan kisar yang bertanda * dan rempah kuzi. Tumis hingga terbit minyak. Masukkan air dan biar hingga mendidih. Kemudian masukkan susu sejat dan sos tomato. Bila mendidih, masukkan kerisik, buah keras, tomato puree dan ayam. Kemudian masukkan gula, garam, kismis, hati dan pedal ayam dan bawang goreng. Bila masak, angkat dan hidangkan dengan roti jala. Masukkan semua bahan dlm blender dan kisar hingga sebati. Panaskan kuali non stick dan tirai adunan. Assalamualaikum… anything interesting happen today? Today like any other week days, I started my day by preparing breakfast for my hubby and 4 girls. Normally by the time breakfast is on the table my 2 younger girls are still struggling to get dress….but today surprisingly they were ready before I managed to bring food to the table…. want to know why? Shaun the Sheep! Yes… my hubby purposely switched on the show to motivate Sofea and Jasmine to get ready faster…. ha ha ha. Well, I guess you have to find ways and means to make sure that they do what you want them to do.. better than yelling at them early in the morning…. Bravo to my hubby! OK, menu for lunch today is Nasi Ayam. This recipe I got it from my auntie Cik Yah ( FB glamor name : Mek Asiah Hamzah)…well, actually my mom got it from her and I learned it from my mom. Being using this recipe for years. Wash the rice till the water runs clear and drain well. In a large pot, fill in the water, ginger and salt, bring to boil. Add the chicken in, cover the pot and immediately turn off the stove. Leave the chicken in the pot for 20 minutes. After 20 minutes, take out the chicken and bring the water to boil again. Add the chicken in, cover the pot and immediately turn off the stove. Leave the chicken in the pot for another 20 minutes. Take out the chicken and set aside until ready to be deep fried. Keep this chicken broth for cooking the rice and making the soup. Heat wok on high, add 2 tbsp of oil. Add mince garlic and stir-fry for few seconds. Add in the rice that you have prepared and cook for few minutes. Transfer the rice into the rice cooker and add sufficient chicken broth to cook. For the soup, heat up the remaining chicken broth, add in salt and carrots, bring to boil. 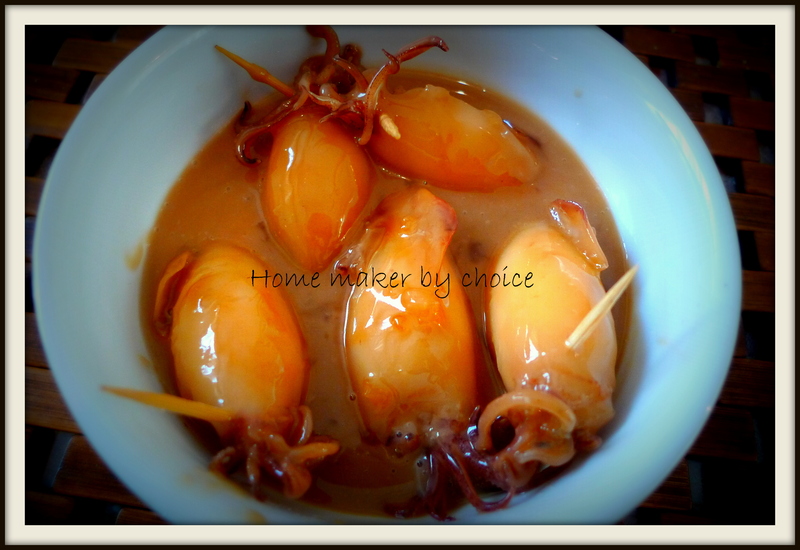 For the sauce, blend red chilies and garlic well, add in lemon juice, salt and sugar to taste. 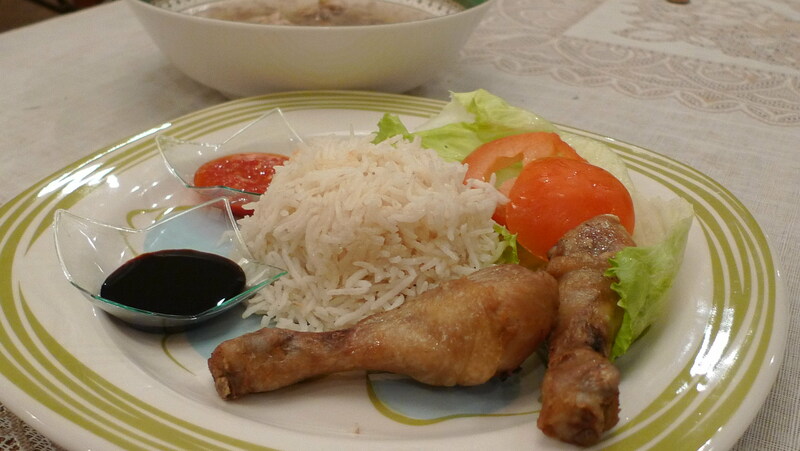 Serve the rice with fried chicken, soup, salad, soy and chili sauce.